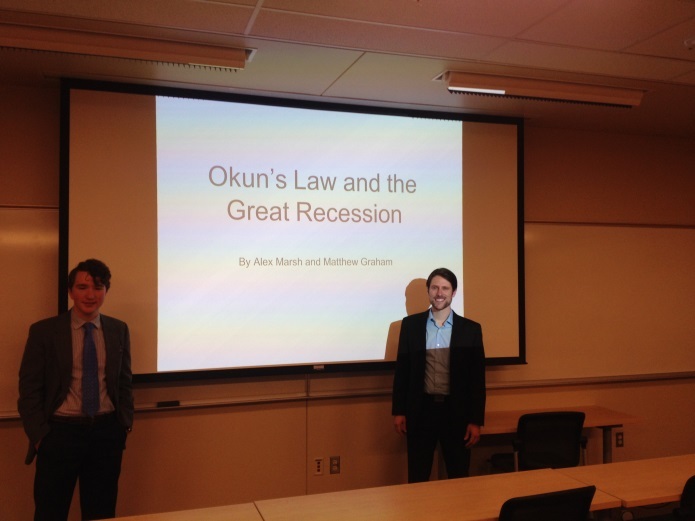 Belmont student Alexander Marsh and alumni Matthew Graham, economics, recently attended and presented their co-authored paper titled “GDP, Unemployment, and the Great Recession: Utilizing Okun’s Law to Analyze the GDP Drop from 2005-2013”at the National Conference on Undergraduate Research (NCUR) held at Eastern Washington University. The NCUR is an interdisciplinary conference where students representing universities and colleges from all around the world present research and creative works in oral, poster and performance/visual arts presentations. The team’s research studied the relationship between an economy’s output and unemployment, a relevant topic that has recently been an ongoing topic of discussion. The application of Okun’s law to modern business cycles can produce valuable insight to a country’s economy. Using quarterly data from 2005 to 2013, the study utilized a production function approach to analyze the relationship between GDP gap and unemployment during the Great Recession. Findings revealed that unemployment, capacity utilization and the size of the labor force have a statistically significant impact on the GDP gap during this time period. Belmont is a member of the NCUR, whose mission is to promote undergraduate research, scholarship and creative activity done in partnership with faculty or other mentors as a vital component of higher education. The students were accompanied at this conference by research advisor and faculty member Dr. Colin Cannonier.